Adolf Hitler’s name is rightly synonymous with evil. His reign of terror set Europe ablaze and left behind a legacy of blood and hatred. No one can deny this. But set all that aside momentarily, difficult as that may be, and what you’re left with is a human being who lived and died without ever having heard the Beatles, and is that not, in its own small way, a tragedy? Of course, I couldn’t possibly defend Hitler. But the fact that he died in 1945, 15 years before the Beatles kicked off an eight-year run of iconic albums and immortal singles like “Love Me Do,” “Ticket To Ride,” “Blackbird,” and “Let It Be,” makes me feel a little bad. I still remember the magic, the vitality, that I felt the first time I listened to Rubber Soul, and I guess part of me feels like everyone deserves that feeling—even Adolf Hitler. Now, I’d never, ever say that I wish Hitler, a man who perpetrated the mass slaughter of millions of Jews, should have left that bunker alive. But if he had lived in hiding just long enough for those first raucous songs to make their way to his hiding spot in Argentina, bursting with life and twinkle-eyed mischief, wouldn’t one of the world’s many, many wrongs have been righted? …I guess part of me feels like everyone deserves that feeling—even Adolf Hitler. And I’m not saying that there aren’t plenty of far more deserving people who never got to hear the Beatles, either. Gandhi, for one, would probably have loved their later work, like Sgt. Pepper’s and the White Album. 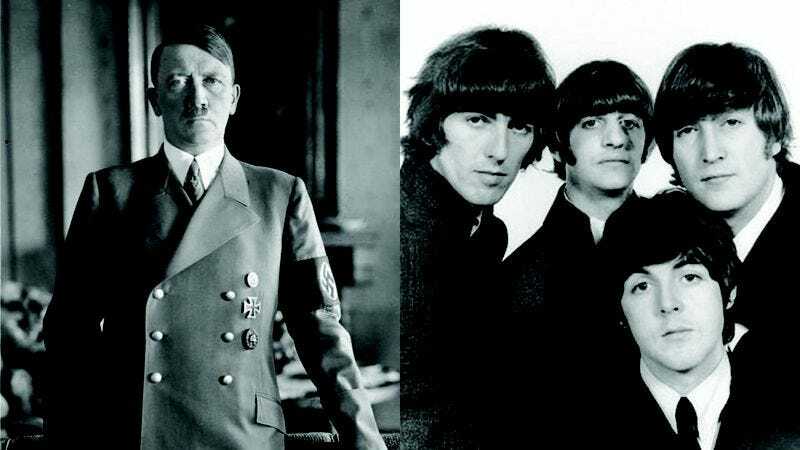 FDR absolutely should have gotten to hear “A Hard Day’s Night.” The Beatles gave the world the gift of their music, and while Hitler definitely didn’t necessarily deserve to receive it, I can’t help but feel the littlest bit bad that he never even knew the feeling of Beatlemania. Picture it: 1965, Shea Stadium, Beatlemania at a fever pitch. Fifty-five thousand fans scream as the Fab Four roar into “Twist And Shout.” The night is filled with the singular sounds of a once-in-a-millennia band. And there, in the exulting throng, just one body among so many, just another face in the crowd, is Adolf Hitler. He nods along, and finally, he understands. However wrong that image may seem, doesn’t it feel, in its own way, right? It’s really just a shame, is all. The whole thing’s just a big shame.